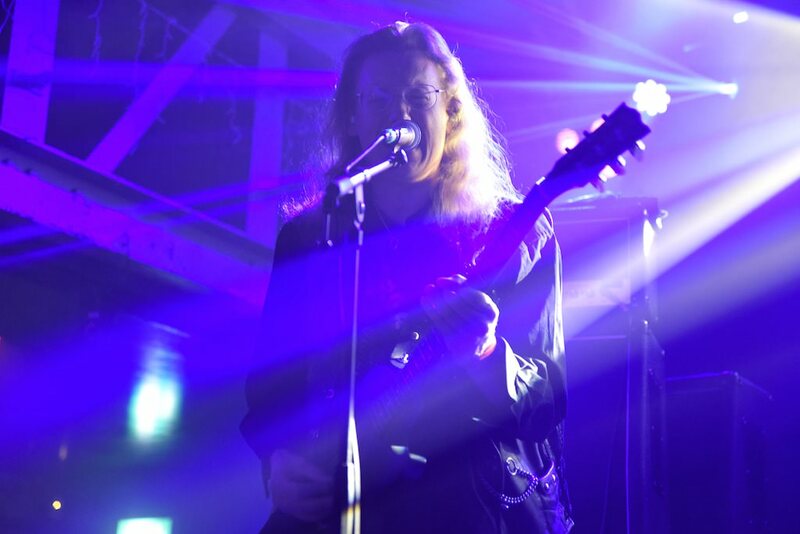 Malthusian (11/13) play on a stage enveloped in a hazy blue sheen, where each musician can only be picked out in outline. It means that the overwhelming and thunderous mix of doom framed black and death metal that rolls out from the stage, seems almost disturbingly disembodied from the band. The bass and drums punctuate everything, with some piercing staccato sections and intense blast beat rushes. The band also know how to use feedback really creatively and atmospherically, as they set up a song. The guitars in unison create a gothic echo, resonant of Siouxsie and the Banshees. Our Survival Depends On Us (11/13), from Austria are a five piece with keyboards, and have a surprisingly and very impressive dream pop/ post rock feel to their songs, interlaced with orchestral type keyboards. When that's punctuated by a hellish scream and pulsating rhythms, the effect is mesmerising. The crowd thinned our a bit towards the end of the set, which felt a real pity as this band are pushing at the boundaries of metal; but then brilliantly increased for the last number. The band at the end of the set said rather movingly, that it had been an honour to play the Festival. Lvcifyre (10/13) on the second stage were lit entirely in pulsating red, like something straight out of Roger Corman's classic film take on Edgar Allan Poe's "The Masque of the Red Death". The cacophony of hammering guitars and drums is simply electrifying, and is played without let up! While getting immersed in the intensity of the music, it's easy to miss the high level of technical playing at work here, as poly-rhythmic drumming interfaces with impossibly fast guitar time changes. Death metal band Dead Congregation (10/13) from Greece go full tilt for head banging sludgy death metal opuses, which raise plenty of devil horns in the audience. They also have a pretty deft touch with anthemic like guitar phrases. On their final number, at one point in the song, the band stand still with heads bowed as choral singing plays; a church bell then heralds one last powerful metal rush. Darkened Nocturn Slaughtercult (10/13) are on the Garage second stage, and gulp ....are spitting blood over the audience! The guitars push at the extremities of black metal, reducing it to its most basic elements, of an almost garage band like musical freedom. It's in the territory that early Mayhem set out to explore. Urfaust (11/13) build some very evocative atmospheres, full of heavy doom song structures with almost blues like vocals, that ratchet up the feel of wretched despair. The sound this duo create live has the musical breadth of an augmented band, as the sound inhabits every corner of the main Garage venue. Finland's Jess and the Ancient Ones (13/13) are a complete revelation. Think the very marvellous Blood Ceremony, crossed with the Jefferson Airplane and the Doors, and you will get some sense of how good this band is. Jess at times sounds like Ella Fitzgerald, if she had joined a metal band. She completely inhabits a song, conveying a breathtaking range of emotions. The band handle a lilting ballad and full on metal attack with equal commitment and playfulness. Jess gives a graceful bow at the end of each number, and on one song the band sound like the Doors must have sounded in their early days, playing on the Sunset Strip in Los Angeles. "Thank you lovely people, its our first time in Glasgow" Jess says to the audience at the end of a fiery set. 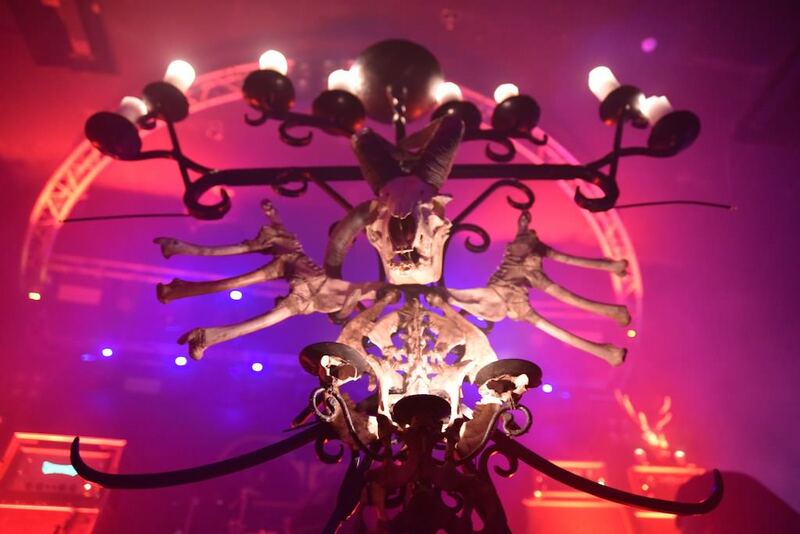 Saturday headliners on the main Garage stage, Dragged Into Sunlight (12/13), bring with them a massive front of stage stately and gothic candle holder with goats skulls lit in red on each side of the stage on amplifier stacks, all together creating a striking stage landscape. They also play completely with their backs to the audience! Their sound has a cataclysmic feel of massed instruments attacking the audience, with an industrial edge to it. The strobe lighting adds further to the intensity of the impact of the music. At times they seem to be seeking to smash through the walls of the Garage with their music. Discordant chords and voiceover occasionally interrupt the full death/black metal head charge, but the pace never lets up. For all the wall of sound dynamics, there are incredible subtleties of rhythm and melody change. A superb set to finish a great festival, that can only go from strength to strength on this showing.